There is to be a ‘Fiddle Bus out from Aberdeen to Glenbuchat when some of his tunes will be played at the places mentioned in their titles. At Glenbuchat Hall there will be workshops, ‘Fiddle Walks’ and a late afternoon concert of his music. The Journey starts at Alford, takes you on to Rhynie, round the Cabrach via Alexander’s home and back to the main Alford Road. 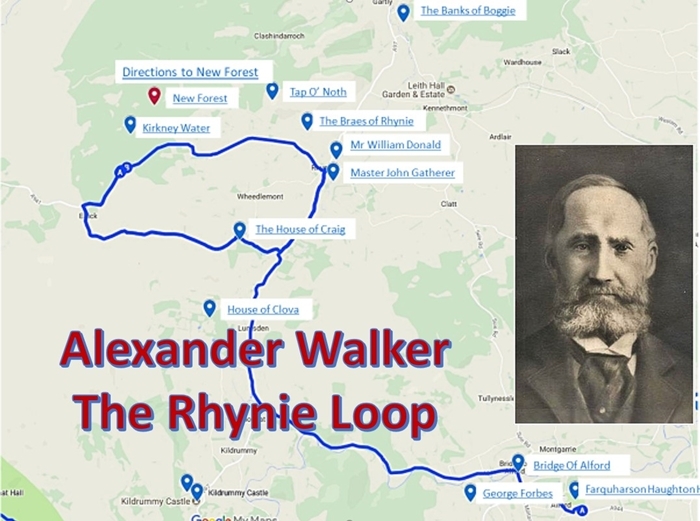 The PowerPoint presentation below shows the route and highlights the names of Alexander’s Tunes related to the area and gives some historical detail behind them. The presentation is best seen on a PC or iPad but can be seen on a Mobile Phone. On the phone if the touch screen areas are too small, a swipe will take you to the next slide.